Liturgical poet of the twelfth century. According to Zunz ("Literaturgesch." p. 348) he lived in the northern part of France, and may be identical (ib. 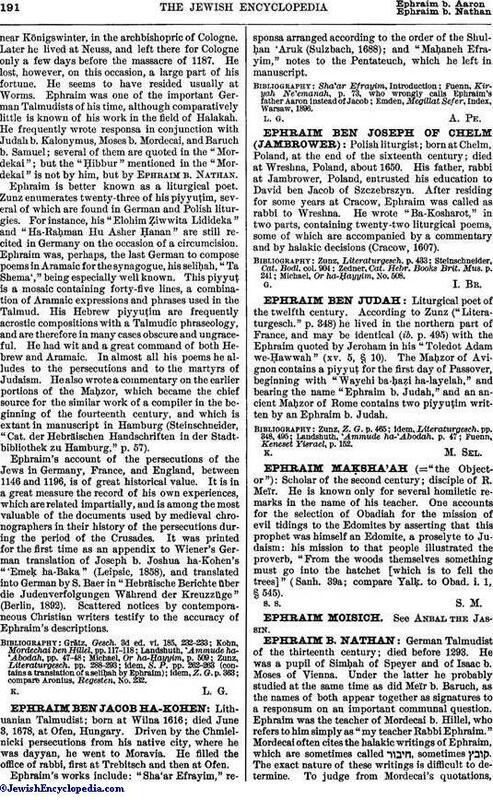 p. 495) with the Ephraim quoted by Jeroham in his "Toledot Adam we-Ḥawwah" (xv. 5, § 10). The Maḥzor of Avignon contains a piyyuṭ for the first day of Passover, beginning with "Wayehi ba-ḥaẓi ha-layelah," and bearing the name "Ephraim b. Judah," and an ancient Maḥzor of Rome contains two piyyuṭim written by an Ephraim b. Judah. Fuenn, Keneset Yisrael, p. 152.